THE landscape was leached of colour but the stark monochrome tones still served up a steely beauty. There were few signs of life yet evidence of it everywhere. Scotland during a snowy January is a land of contradictions, and all the better for it. This day seemed to encapsulate a mood of simpler times, 1930s noir, nature stripped back to base shades and tones. Having just seen The Revenant, I couldn’t help feel that the director’s colour scheme had been inspired by a scouting trip to this part of the world. I had left behind the juggernauts hurtling down the A9 dispensing spray and a passing rush of wind and within minutes was engulfed in a silent, white world. The track east by the aqueduct was covered in fresh snow, disturbed in places only by the tracks of birds, hare and deer and other smaller creatures. Ahead, the higher reaches of Meall Chuaich lay hidden, merging into the backdrop of a washed-out sky. As I rounded one corner the waters of the lochan lay still, a pressed steel sheet dividing two slopes. Every so often the silence was broken by the gargling lek-lek-lek calls of grouse, a warning cry that seemed to set off a chain reaction right across the barren surroundings, each further one a few decibels lower than its neighbour. Now and then there was an explosion of feathers as they scrambled out of the undergrowth, a short, noisy flight over to perceived safer ground. The closer I got to the mountain, the more it began to regain its shape, fighting its way back out of the nothingness that had camouflaged it so well. 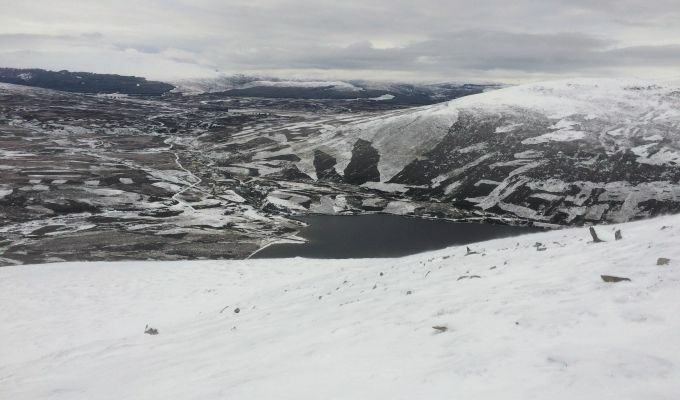 The conditions were similar to that of the previous weekend’s walk up Ben Ledi in the Trossachs; deep, soft snow that baulked against any chance of steady walking. One minute it was holding my weight, the next I was collapsing up to knee-depth. This staggered stride pattern continued most of the way, a fast pace over rising ground being replaced by unpredictable steps every time the terrain took a dip. Higher up, the snow became more solid but the angle was gentle and there was no need of crampons. A lone hare made a slow, loping run across the skyline, but it was no hurry, as if it fully aware there was no way I could have got close in these conditions. We watched each other for a minute or so before it decided there as little of interest to keep it there. As I made my way up the final rise, I thought I could see a glint of light from a snow-covered outcrop ahead on the right. I stopped and waited for another flash but it never came. A brief moment of colour had got me excited and disappointed. At one point, I could hear the distant thrum of rotors, the rolling thunder of a search helicopter heading over the Monadh Liath mountains. 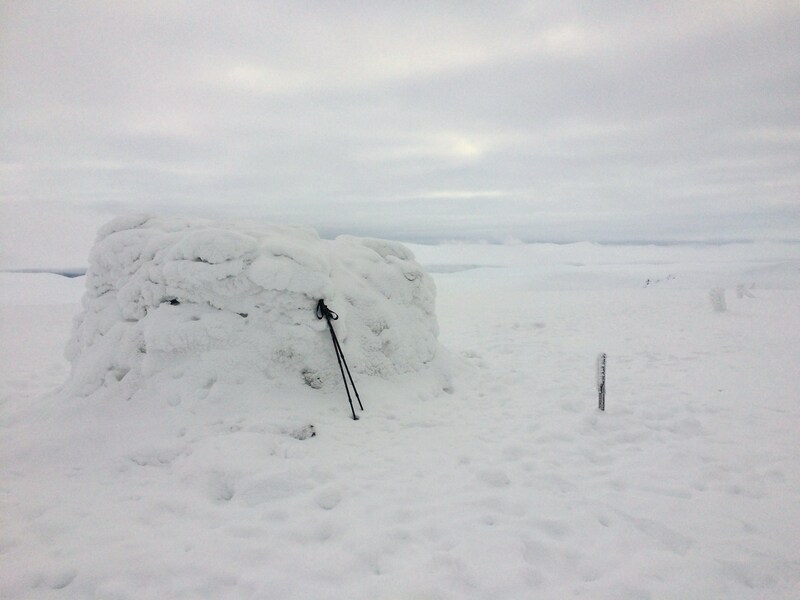 The huge summit cairn emerged from the whiteness like a giant, headless snowman, the fence posts a frozen guard of honour, their iced coating providing an obvious clue as to which direction the wind had been blowing. 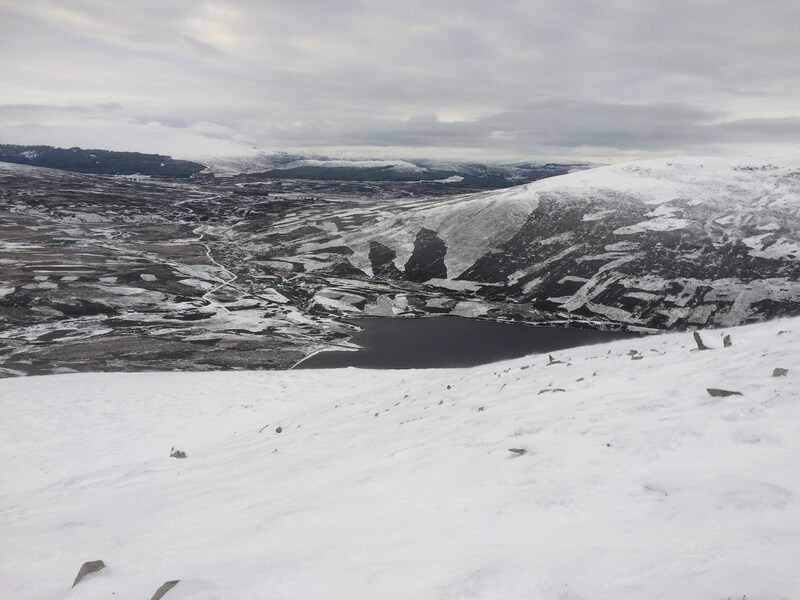 The view to the north and east looked as though it had been swamped with Tippex, contours and shapes impossible to decipher in the immeasurable whiteness, but west and south was a patchwork quilt of black, grey and white. Silence still held the upper hand as I made my descent, just the odd crack and crunch of frozen ground under the overcoat of snow. And the odd grouse, of course.